It may be ridiculously cold outside, but I can summon a touch of summer just by heading down to my basement freezer. Thanks to a stash of homemade prepared ingredients I'm able to throw together a stick to your ribs dinner that while perfect for winter reminds me that summer will come again. The key tastes of summer for this vegetarian chili come from a batch of my roasted tomatillo salsa and a packet of frozen grilled corn kernels. As always my harvest of tomatillos was overwhelming. It seemed like every week I feverishly made and froze batches of the salsa. Sure I love just defrosting it and diving right in with chips, but it makes for a great sauce for pork or chicken or, in this case, chili. As a last minute idea, I tossed in some local corn which was abundant at the farmers market this summer. We took full advantage, grilling as many ears as we could to enjoy in the moment and for times like now. I just cut the cooked kernels off the ears, vacuum-sealed them in 2-3 cup portions and popped them in the freezer. Right now summer seems so far away, but never fear, it will come again. 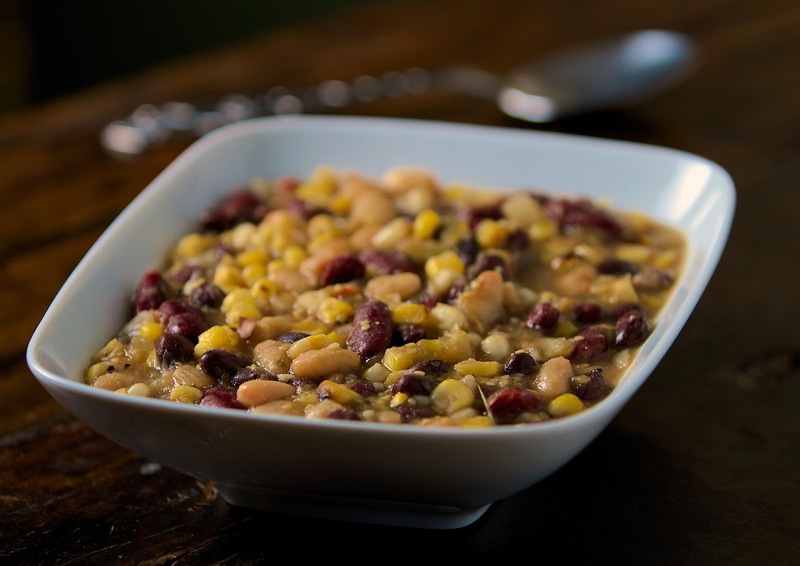 In the meantime, hunker down with cozy blankets and make a pot of this chili. In a large pot heat the olive oil. Add the onion and saute until translucent. Add the hot pepper and garlic. Saute for 2-3 minutes. Season with cumin. Mix around the pan until it becomes fragrant and darkens slightly in color. Stir in the roasted tomatillo salsa, all the beans, and the corn kernels. Season with salt and pepper to taste. Let it come up to a light boil. Cover, turn heat to low and simmer for 20 minutes. Yes, you can use store-bought frozen corn and, for that matter, store-bought green salsa. For the salsa just remember to read the label and choose one with good quality ingredients.